There are several dozen of this model of monitor at my work since last year or so; the other day I found one on top of the dead electronics plunder pile recycling bin, looking brand new. Googling the model # and terms such as “problems” or “repair” or “won’t turn on” revealed pages of discussion on the badcaps.net forums: it seems this model of monitor is yet another victim of the bad capacitor plague that somehow continues to sweep the electronics world. Upon opening the monitor, this suspicion was confirmed by several visibly bulging capacitors in the low-voltage section of the power supply. Note: This power supply board (or very similar model) appears to be used in a variety of monitors from different manufacturers. Depending on which one you have, your symptoms may differ to what I have observed on the AL2216W. In particular, the monitor may simply not turn on (too-low logic voltage or software-controlled shutdown), may blink its power LED to indicate a fault, or may turn on for a few seconds and switch off again. In my case, the monitor showed absolutely no external signs of life (power LED dark and no response to the power switch), but a very brief flash of the backlight could be seen just as the unit was unplugged, confirming it did indeed have power but “chose” not to switch on (likely as a safety feature). This is a wall-powered electronic gadget. Opening it and poking around inside carries a small, but non-zero, risk of electric shock even when unplugged. (There is a 100K bleeder resistor across the mains filter cap, but this could fail.) For your safety, wait at least one full minute after unplug to go near the supply board, and use a screwdriver with an insulated handle to short across the leads of the filter cap to be sure it is discharged. If you see a fat spark and blinding flash of light, the safety bleeder resistor has probably failed, and you might want to reconsider poking around in here. This is fairly straightforward. Pop off the plastic cover hiding the screws that attach the base. Unscrew them and any other visible screws, then carefully pry at the seam where the two halves of the monitor “shell” come together. Once inside, more screws. Note that to get the final metal shields off, the backlight connectors and the ribbon cable to the button panel must be disconnected, then the scew-in posts for the video connectors and two screws concealed in the mains cord socket must be removed. Surprisingly little, it turns out. There is one large power supply board (made by Delta Electronics, Inc.) and a much smaller display controller board (marked A220Z1-Z01-H-S6) with only two highly-integrated Realtek ICs and some discrete components. My educated guess is that the controller boards are very unlikely to fail, so start by looking at the Delta board. By all accounts, bad capacitors are usually the underlying cause of these problems. Due either to being under-rated or a sordid tale of corporate espionage (see Wikipedia link above), the capacitors will gradually vaporize their electrolyte (and sometimes not so gradually, with a bang) until they can no longer perform their capacitorly duties, causing the monitor to go haywire. First, inspect all the electrolytic (“tin-can”) capacitors for visible problems. Their tops normally have a score pattern on them, but should otherwise be flat. They should not bulge upward, even a little. Visible bulging, ruptured tops or signs of leakage (e.g. brown goo around the top or seams) are sure signs they need replacing. Note that failed or failing caps will not always show visible signs. On the Delta DAC-19M010 board, things are divided up into 3 logical sections: the bottom half is a switching power supply that steps your 120/240V wall power down to a 13.8V and 5V rail. Roughly speaking, everything to the left of the large center transformer is its primary (high-voltage) side, and everything to the right is the low-voltage secondary side (the high side may also be marked off by cutouts and/or a line on the underside of the board). The upper half of the board (more or less) is the backlight inverter, with another large transformer to step this low voltage up to the 1kV or so needed to feed the CCFL backlights. I’m sure you noticed the large, high voltage cap on the high side, right near where the power cord plugs in. You did short it, right? This is the one that can make your skeleton glow even if the monitor is unplugged. Luckily, consensus from the internet is that this filter cap on the primary side rarely fails, so unless it is showing visible signs you can probably leave it alone. There are seven electrolytic caps on the low-voltage side, all of which should be replaced if you even slightly suspect a capacitor problem. (Technically, the topmost one connects to the backlight inverter, but you should change it anyway.) On my monitor, the 13.8V rail read a tad high (14.x) and the 5V rail showed only 4.1V. There is likely an undervoltage lockout circuit on the controller that prevents operation at this voltage, although there may have been significant voltage ripple due to the bad caps that was resetting or otherwise fouling up the logic directly. With the caps replaced, it’s a good idea to check for any obvious collateral damage. There are several surface-mount fuses (denoted Fxxx) on the bottom of the board which might have been affected (zero-ohm resistors may have been stuffed in place of some fuses; check these too). After you triple-check that the mains filter cap is discharged, also check the through-hole fusible resistor to the immediate left (high voltage side) of the switching transformer. There is also a surface-mount fuse on the controller board near the power entry connector. Here are suitable replacement parts currently available on Digikey. Be careful when removing the old ones, as some of them are near very brittle powdered-core inductors and tacked down with some kind of glue. Note, one of the parts below has a higher voltage rating than the original (this is OK). * Note, if the screen’s backlight cuts out (often after a couple seconds) but the monitor appears to remain powered, the fault is most likely in the backlights or backlight inverter section of the power supply board, not the low-voltage section. 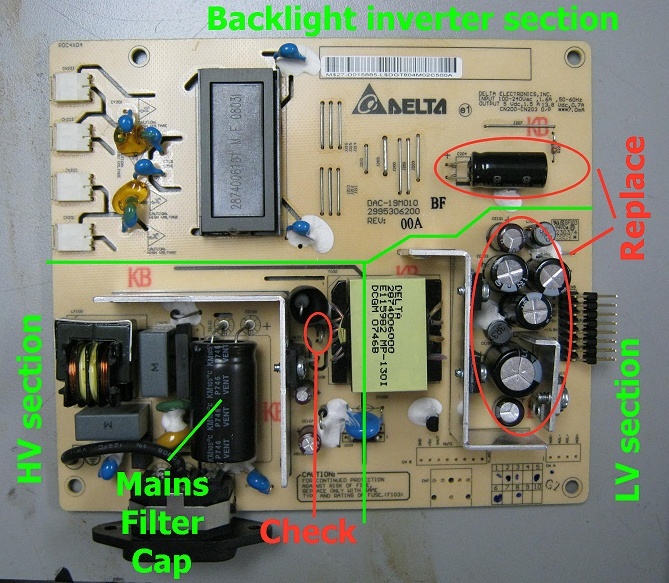 You can confirm whether the entire system or only the backlight has shut off by holding a strong flashlight directly against the screen while a valid video signal is present – if you can see the image around the edges of the flashlight, the low-voltage supply and controller board are probably OK. Replacing C204 MAY solve it, but otherwise, fixing backlight issues is a whole different animal, which I don’t cover here. You MAY be able to identify a single dud tube by unplugging one at a time (WITH THE MONITOR UNPLUGGED!!!) and testing the monitor, but this is not 100% reliable (some inverter circuits will detect a single “open” (e.g. unplugged) tube and shut down anyway).